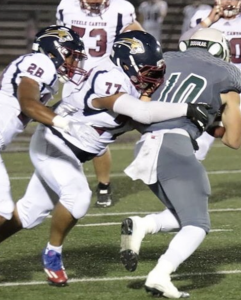 LA MESA – Steele Canyon coach Scott Longerbone took a chance on Chance Johnson, and Chance Johnson took a chance on a bum right knee. And those chances wound up paying a huge dividend for Steele Canyon in its epic 22-21 come-from-behind upset of mighty Helix on Friday night. With the win, Steele Canyon (8-2, 4-1) forged an improbable three-way tie for the Grossmont Hills League championship with No. 3-ranked Helix (6-4, 4-1) and No. 10 Granite Hills (9-1, 4-1), which shut out Valhalla 43-0. Chris Carter and Antoine Walker are the normal punt return specialists for the Cougars, but Walker injured his shoulder after intercepting a pass on the final play of the first half with Helix leading 14-3. After battling back in the second half, Steele Canyon forced Helix to punt on a fourth-and-14 from the 21-yard line with 2:42 left in the game and the Scotties leading 21-16. Longerbone, who also coaches the punt return unit, put Johnson back to receive the punt, and Johnson responded with a huge 28-yard return to put the Cougars in prime position for the upset. And Johnson got it. 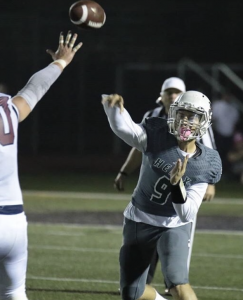 His return to the Highlanders’ 24-yard line set up the winning score as Steele Canyon snapped an eight-game losing streak to the Scotties and secured the Cougars’ first league title since 2005. On first down, senior quarterback Nathan Barnett rushed for 2 yards. Carter took the next handoff around left end for a short gain, but Helix was penalized for a face mask, putting the ball at the 14-yard line. Cazz Trisby then took a jet sweep around right end for 9 yards and a first down at the 5-yard line. Kenneth Watson got the next call and bulled down to the 1-yard line with 1:11 left to play. Then Wesley Neely III gave the Cougars their first lead of the game with a 1-yard sweep right touchdown with 1:05 on the clock. A 2-point conversion pass attempt failed as Barnett was forced to throw the ball out of the end zone after a bad snap, but Steele was up 22-21. The Highlanders had won five straight games and hadn’t trailed in the second half since losing to Cathedral Catholic, 30-21, on Sept. 7. Now they had 65 seconds and 80 yards to go to try and pull this one out, but Helix had attempted only one pass in the second half to that point. Daniel Amon’s first pass on the drive was incomplete. His second was intercepted by Willie Page, who juggled the ball for a few steps before pulling it in around midfield with 0:43 to play. After three kneel-downs by Barnett, the Cougars celebrated their 16th win in their last 18 games dating to last year’s eight-game winning run to the San Diego Section Division II championship win over Ramona and the State Division 3-A title win over Half Moon Bay. Helix won last year’s section Open Division championship with a 26-19 win over Mission Hills before losing in the State Division I-AA title game, 49-42, to Folsom. The Highlanders had also played in four straight Open Division finals, beating St. Augustine in 2015. 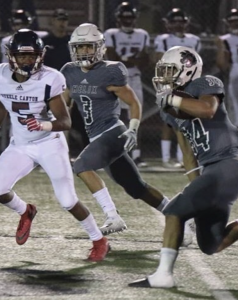 Helix had beaten Steele Canyon eight straight times since 2009 by an aggregate score of 302-55 and had a 19-game winning streak in league games since a loss to El Capitan in 2014. No. 34 would be All-Section tailback Elelyon Noa, among the best running backs in the county, if not the best. Noa rushed 23 times for 274 yards and touchdowns of 53 and 22 yards, but Steele Canyon did a fine job of keeping the Helix offense off the field in the second half. Helix QB tandem of Amon and Delshawn Traylor completed only 5-of-14 passes for 54 yards with no touchdowns and two interceptions. 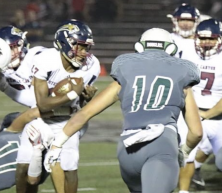 Not in the linescore, Steele Canyon had a 12-play non-scoring drive that kept Helix’ offense off the field for about 7 minutes in the fourth quarter. In numerous games this season, Helix has been downright dominating in the third quarter, especially in big wins over St. Augustine and last week against Granite Hills. “We knew the third quarter was going to be the difference,” Longerbone said. “The third quarter was the quarter we focused on all week. “You have to get through the snowflake that becomes a snowball that becomes an avalanche. “Offense and defense working together. It was our offense grinding them down and our defense getting the stops when we needed it most. Helix scored on the seventh play of the game as Noa burst up the middle for a 53-yard touchdown run, getting a huge gap from center Noah Viloria and guards Isaac Gonzalez and Nathaniel Adams. The drive covered 96 yards in only 2:54. Steele Canyon countered after seven plays when Jonathon Kenney booted a 37-yard field goal. After Helix stopped a fourth-and-2 attempt in the second quarter, Noa again burst up the middle for a 22-yard TD and a 14-3 Scotties’ lead. Helix threatened once more before intermission, but Walker intercepted a pass near the goal line on the final play. Noa had 13 rushes for 162 yards at halftime as Helix piled up 239 yards to the Cougars’ 114. “Going into halftime we felt kind of down,” Neely said. “We just came back out and pushed it in. Steele Canyon got the ball first to open the second half, but the Cougars were starting at their own 8-yard line. Neely ran for 3 yards on the first play. On the next, a low snap forced Barnett to pick the ball off the ground. He nearly touched his knee in the process but soon scooted up the middle for a huge gain before darting left into clearance around the 40-yard line. Barnett’s 89-yard touchdown pulled Steele Canyon within 14-10. Despite a couple of sacks and some big stops by Helix, Barnett finished with 115 rushing yards on 19 carries. Neely added 80 yards on 14 carries with two touchdowns, and Watson took six carries 51 yards. Barnett was only 4-of-9 passing for 29 yards, but Steele Canyon had only one turnover, a fumble recovered by the Highlanders’ Jagger Giles. Steele’s offensive line of Billy Tellous, Aramis Carson, Darrin Roldan, Sommer Audeh and Josh Constancio deserves credit for the Cougars getting 276 rushing yards. Shortly after Barnett’s 89-yard TD, Noa reeled off an 81-yard gain to give Helix first-and-goal from the 8-yad line. Noa came off the field, so Traylor lined up at running back and took the next play 8 yards for a touchdown and a 21-10 Helix lead. With 2:10 to play in the third quarter, Neely’s 7-yard touchdown made it 21-16 as he got a tremendous block by Kenneth Watson on the sweep right. Helix ran only 11 plays in the third quarter and eight in the fourth quarter. While Helix was trying to make the Open Division playoffs for the fifth straight year, this loss probably knocks them back to Division I as the section is only selecting four teams for the Open Division this season. Steele Canyon is also in Division I. Both schools figure to get home games in the first round next week when the playoff seedings are determined Saturday morning.